J.P. Das is an Indo-Canadian psychologist and an internationally recognized expert in Intelligence. Among his major contributions to psychology is the PASS (Planning, Attention, Simultaneous, and Successive) theory of intelligence. He is currently engaged in expanding planning to include executive functions. What might be the implications of these higher mental activities for education as well as management behavior is the topic of this book. Professor Das is an Emeritus Director of the Centre on Developmental & Learning Disabilities (named after him) at the University of Alberta, Edmonton, Canada, and Emeritus Professor in Educational Psychology. He has authored and co-authored over a dozen of books and contributed more than 300 research papers to international journals and edited volumes. 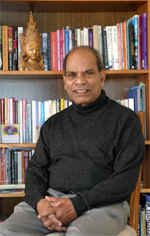 His earlier published titles with SAGE include Cognitive Planning: The Psychological Basis of Intelligent Behaviour (1996, co-authored with Binod C. Kar and Rauno K. Parrila); The Working Mind (1998); Reading Difficulties and Dyslexia: An Interpretation for Teachers (2009); and Consciousness Quest: East Meets West (2014).